I have [insert any sin]. Will God forgive me no matter what? "Will God forgive me for _________?" Yes, yes, and yes. Whatever sin you can enter into that blank, the answer is this: Yes, God will forgive you. You may think your sin is so horrible that God could never forgive you, but it doesn't matter how big or small it is. God's forgiveness never runs out. Remember when they murdered Jesus on the cross? And yet He still said, "Father, forgive them for they know not what they do" (Luke 23:34). First John 1:8-9 says, "If we say that we have no sin, we are deceiving ourselves and the truth is not in us. If we confess our sins, He is faithful and righteous to forgive us our sins and to cleanse us from all unrighteousness." When Jesus paid for our sins, He paid for all of them—past, present, and future. There is nothing you can do that He would have forgotten to cover or wouldn't want to cover. He paid the price for the entire human race and all our wickedness (Isaiah 53:5-6; 2 Corinthians 5:21). Salvation and forgiveness are linked. If you have received that salvation, which is forgiveness of sin, then you are fully forgiven of your whole debt of sin. Romans 10:9 says, "If you confess with your mouth that Jesus is Lord and believe in your heart that God raised him from the dead, you will be saved." If you have not received Christ as your Savior, then what are you waiting for? Tell Jesus that you believe He is Lord, and confess your sins so you can be forgiven! This is both the hard part, and the best part. This forgiveness of sins is entirely through God's grace, and not our works. There is nothing you can do to earn forgiveness (Romans 3:20-22). Ephesians 2:8-9 says, "For by grace you have been saved through faith. And this is not your own doing; it is the gift of God, not a result of works, so that no one may boast." Rest in that knowledge—that you do not need to work for salvation and forgiveness. It's true. Even though you know you are forgiven, you may still feel guilt over your sin. Guilt will still hang around with us if we don't forgive ourselves. But sometimes feeling a little guilty is not necessarily a bad thing. Guilt is a natural response from our conscience to remind us not to repeat those sins. Confess your sins and know that you are forgiven by God. Then remember to forgive yourself too, because the past is in the past and cannot be changed, but you still have control over what you do today and tomorrow. God loves you. This is such a simple sentence but so mindblowingly amazing. And through that love, He gave His Son to pay the debt we owed because of our sins. And now we have this beautiful gift of forgiveness. It is only selfish pride that would fight that gift. Only pride would say, "My sin was too much for Jesus to forgive." But 2 Corinthians 12:9 says that Christ is sufficient: "But he said to me, 'My grace is sufficient for you, for my power is made perfect in weakness.' Therefore I will boast all the more gladly of my weaknesses, so that the power of Christ may rest upon me." 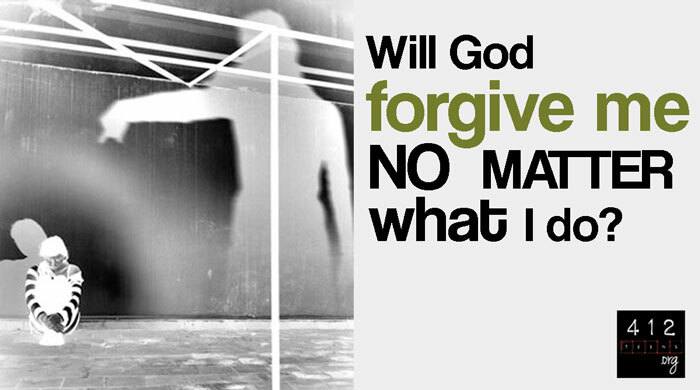 If you're asking yourself, "Will God forgive me for _________? ", the answer is this: Yes, God will forgive you. There is no sin so horrible that God could never forgive you. His forgiveness never runs out. Jesus paid the price for the entire human race and all our wickedness (Isaiah 53:5-6; 2 Corinthians 5:21). If you have received salvation, which is forgiveness of sin, then you are fully forgiven of your whole debt of sin (Romans 10:9). We may still feel guilty for committing that sin, but guilt is a natural response from our conscience to remind us not to repeat those sins. Confess your sins and know that you are forgiven by God.